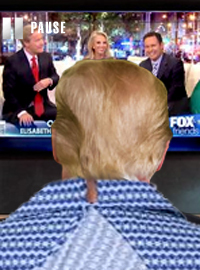 WASHINGTON, DC – President Donald Trump has been sitting in bed, starring at a paused image of the television show “Fox and Friends” for three hours, waiting for the program to continue. Early this morning several of Trump’s advisors met with Trump in his bedroom to discuss a development in an international conflict. During the meeting one of the advisors paused the TV. Since the meeting White House staffers have been looking for the remote to un-pause the TV but they have so far been unable to find it. When asked if he is hiding the remote, Trump shouts that he is watching his “stories” and to leave him alone. “I am watching TV! I am watching TV! This is TV time! I’m watching Foxy Friends and it’s my favorite and leave me alone!” said Trump from his bedroom. White House press secretary Sarah Sanders said the President is working hard and “deep in thought” while he is starring at the paused screen. Insiders say that staff members are working on a plan to cut power to Trump’s bedroom if the President doesn’t leave his bed soon.